The Ariane 5 for Arianespace Flight VA239 moves into position at the ELA-3 launch zone. The Ariane 5 for tomorrow’s Arianespace flight with a pair of telecommunications satellites has moved to the launch zone at the Spaceport in French Guiana, positioning it for an evening liftoff to geostationary transfer orbit with the Intelsat 37e and BSAT-4a payloads. For this ninth Arianespace mission of 2017, the Ariane 5’s rollout occurred today – with the vehicle riding atop one of two operational launch tables for its return to the pad. 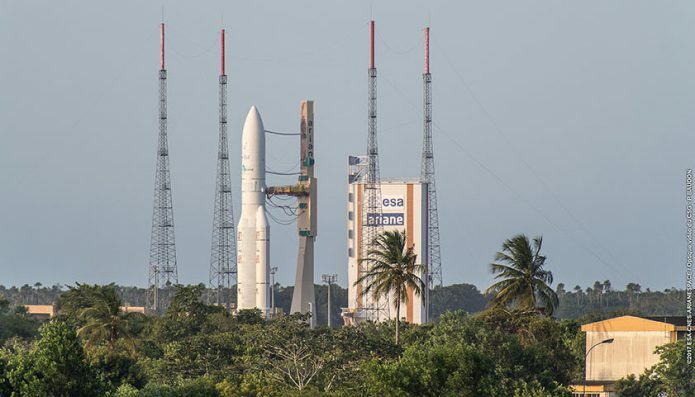 Tomorrow’s mission is designated Flight VA239 in Arianespace’s numbering system for its launcher family, and will deliver a total payload lift performance of approximately 10,840 kg. To be released first during the 47-minute mission will be Intelsat 37e – becoming the fourth EpicNG spacecraft orbited by Arianespace for Intelsat. This Boeing-built spacecraft, based on the 702MP platform, is the first to offer interconnectivity between three different bands. It is designed to deliver high-performance service in C-, Ku- and Ka-bands for use in wireless backhaul, enterprise VSAT and mobility networks. 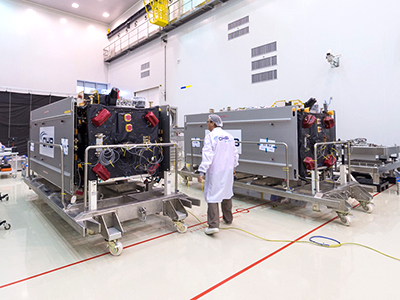 Flight VA239’s BSAT-4a passenger will be launched by Arianespace for satellite manufacturer Space Systems Loral in the framework of a turnkey contract with Japan’s Broadcasting Satellite System Corporation (B-SAT). To be utilized for Direct-to-Home (DTH) television service in Japan, BSAT-4a is based on Space Systems Loral’s SSL 1300 platform. The relay platform is equipped with 24 Ku-band transponders and will expand the availability of advanced television services such as high definition and 4K/8K ultra-high definition. In other activity at the Spaceport, the first two satellites for Arianespace’s Flight VA240 with Ariane 5 have begun their checkout. Targeted for a liftoff on December 12 carrying a quartet of Galileo navigation spacecraft, this mission will be performed on behalf of the European Commission under a contract with the European Space Agency (ESA). 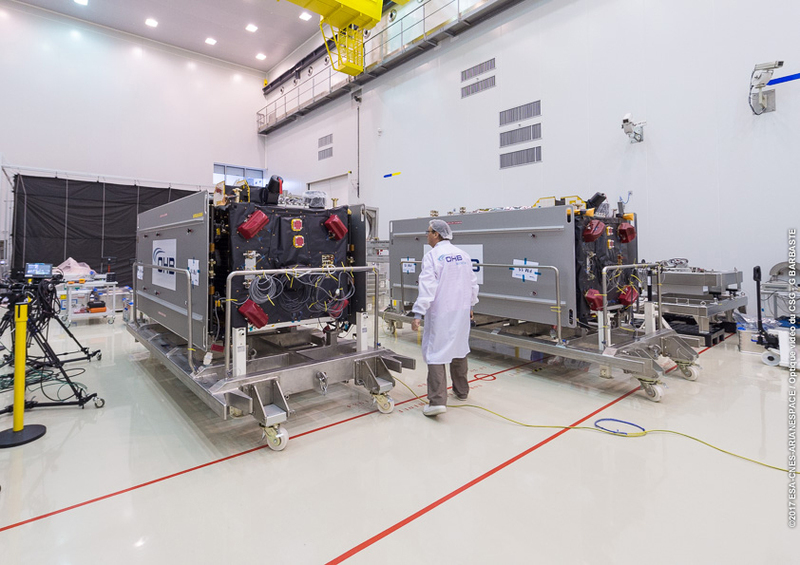 Two of the four Galileo satellites for Flight VA240 undergo their checkout processes at the Spaceport. Arianespace already has launched 18 Galileo spacecraft, with four being deployed into medium Earth orbits on a previous Ariane 5 mission (Flight VA233 in November 2016), and the others lofted by seven medium-lift Soyuz vehicles carrying two satellites each. Galileo is designed to provide a European global satellite navigation system with precision positioning services under civilian control.